It is winter in Southern Hemisphere and a lot of people are heading skiing to Snowy Mountains in Australia or Southern Alps in New Zealand. While I was living in Europe or Canada I was used to drive with all season or winter tires and never had a chance to use show chains. But in Australia or New Zealand snow is only high in the mountains so of course you won’t be changing tires for weekend trip to ski resort or if you want just to cross mountain range above snow line like Arthur Pass in New Zealand. Nobody will force you to hire snow chains but for peace of mind I would definitely recommend do so, as you can stuck somewhere on not passable road. 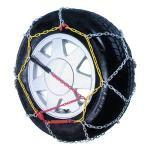 Of course snow chains are must to have if you are going skiing in New Zealand. May be you’ll end up without need to use snow chains, but if you never ever used it, you should ask for demonstration how to fit when renting it. It easy to fit it when you know it, but you can damage car heavily if you are not experienced with doing it and will do it wrong. On the snow chains bag usually there are instructions how to use it, but it was unreadable on bag I had. I was lucky as somebody in my car knew how to fit chains, otherwise I would be in big trouble. Don’t do such mistake.